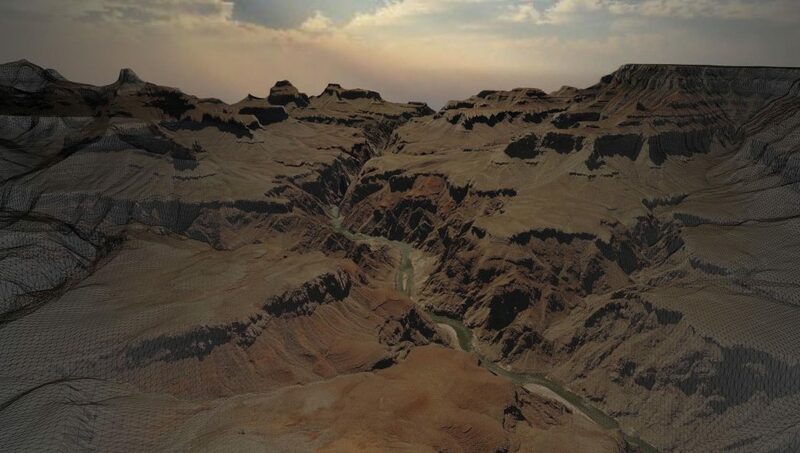 This demo scene will show you a different application of GO Map, capable to produce wonderful landscapes and 3D models of the real world using both elevation data and satellite images. This map doesn’t use vector tiles at all and if you take a look at the GOMap inspector you’ll see that the Layers list is empty. POI and Labels are disabled too. The satellite mode is activated by checking the “UseSatelliteBackground” flag. GO Map will replace the background of each tile with a downloaded texture. Satellite textures are available only with the Mapbox and ESRI apis at this time. Elevation data is available only up to zoom level 15, and this is not a major problem because zoom level 15 is accurate enough for location based games. But a tile at zoom level 15 is really big if measured in meters (or unity units) and your 512×512 satellite texture will stretch a lot to fit it, and you probably will see the image pixels. 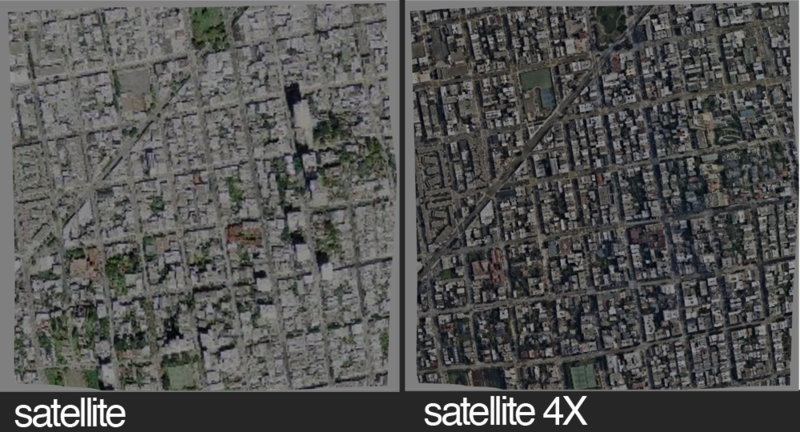 Depending on the your application use case it could be enough to have a single satellite image per tile, but if you would want to have more detail and many request to the map server are not a problem give a try to the Satellite 4X mode. 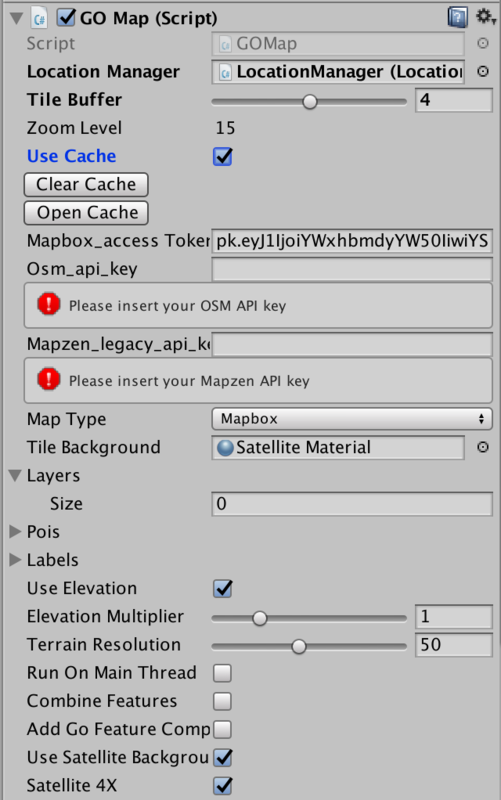 By ticking the Satellite4X checkbox GO Map will download 4 textures per tile of a higher zoom level (current zoom level +1) and merge them into one. In this scene the camera is very different from the other scenes. There’s no orbit nor pinch zoom but there are some classic controls such as mouse drag and WSAD+QE keys to move around. This is done with the two scrips “GOCameraDrone.cs” and GOCameraLook.cs”. This components were made for this demo and feel free to replace them with your scripts if you want. The upper components makes the camera move backward and forward on all 3 axis, pressing shift will increase the movement speed. The lower component controls the camera rotation by dragging with the mouse. 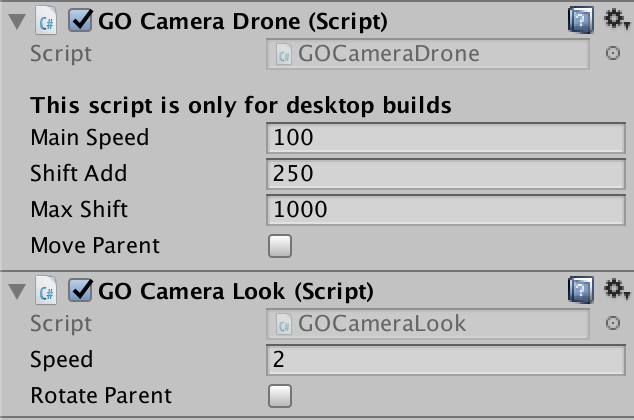 Both components have an option to move and rotate the camera parent instead of the camera, just in case you need it.